There are few bands who could make their whole album into my MP3 player. Most of us, if anything, select a 2-3 tracks and move on. 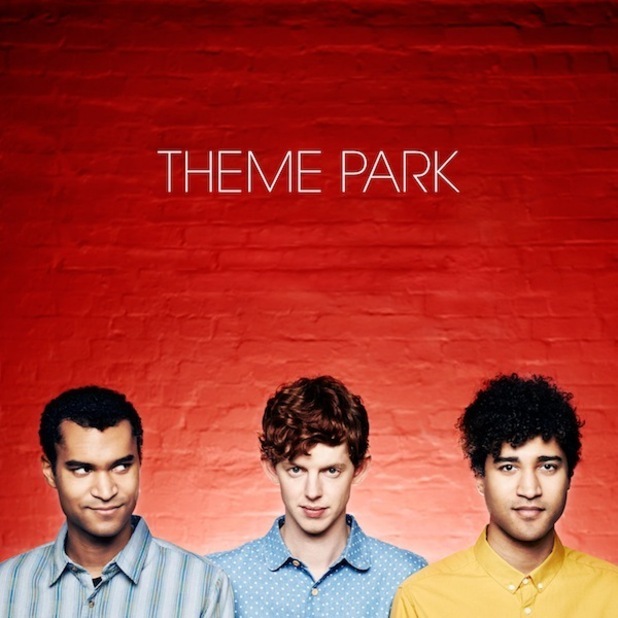 This, however, has not been the case with Theme Park's self-titled debut album. The British band's album has been on repeat ever since it came out 2 weeks ago, and up to now, it is in my short list for "Albums of the Year". The trio has managed to compose 11 tracks that should provide a worth-while experience. They go from synth-pop to new wave to island-esque sounds effortlessly. The only drawback to the album was their exclusion of "Milk" and "A Mountain of Love", which are really good tracks. Overall, this album gets a 4 out of 5. 1. Big Dream - has a good baseline and is just the appetizer, enticing the ears. 2. Jamaica - This perhaps has become my favorite track. It has this really fun, and summer vibe that I can't help, but want to dance. 3. Two Hours - has an 80's INXS vibe, but without the voice. It's just a nice song to spin around the room dancing. 4. A Place They'll Never Know - 80's synth-pop sound to it. It has a slow vibe, but could be an early morning track on the dance floor. The bridge of the song leaves the possibility for a remix. 5. Tonight - is just fun. This song has become the first song I play before heading out for the night. It should work itself into the dance floor in some clubs. I expect a remix of this song. It has limitless potential. 6. Saccades (Lines We Delay) - Every album has the intermission track. This one is it. It's the album's interlude. The track gets going around the 2:06 mark. 7. Wax - the first track I heard from this amazing band. How good is this track? Well, it made me want to get an RSS feed on them. For some reason, I like the single version better. 8. Ghosts - has a great Jamaican/funky riff. This is really a nice "romantic" song with a mid-afternoon pre-party vibe. 9. Still Life - The second slow paced song. This track is ok. It does have a good baseline. It should be a song they play at the end of their shows. 10. Los Chikas - grammatically incorrect in Spanish. At 2 minutes this track is really background noise and their weakest link. They could have added "Milk" instead. 11. Blind - a down tempo song that, to me, has a similarity to "Ghosts". It is still a good track and definitely worth a listen. 1. A Mountain We Love - could be found on the Wax EP. It could have easily taken the place of "Still Life"
2. Milk - the second song I heard from this band. As stated above, it could have easily replaced half of the songs in this album. It is a really good track that got left out of the album. I guess something to get people to buy the singles.